Death by revealing to thee, O Sylvester, the vanity of noble birth and beauty, opened to thee the path of life. May the intercession, O Lord, of blessed Sylvester, the Abbot, recommend us to thee; that what we cannot hope for through any merits of our own, we may obtain by his prayers. Through our Lord Jesus Christ, thy Son, who liveth and reigneth with thee, in the unity of the Holy Ghost, God, world without end. Amen. God often brings the world to those who flee from it, as Sylvester Gozzolini among others experienced. In the thirteenth century, the world, all in admiration at the sanctity and the eloquence of the new Orders, seemed to have forgotten the monks and the desert. God, who never forgets, led his elect silently into solitude, and the wilderness began again to rejoice and flourish like the lily; strength was restored to the weak hands and feeble knees of the sons of the cloister (Isaias, xxxv. 1-3). The austerities of olden days and the fervor of prolonged prayer were revived at Monte Fano, and extended into sixty other monasteries; the new religious family of the Sylvestrians was approved by Innocent IV in 1247. 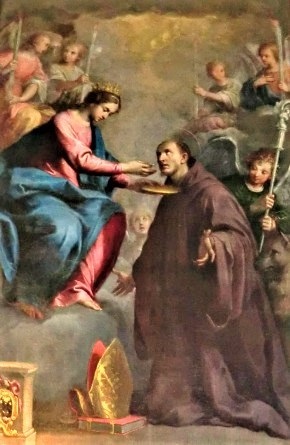 Though originated seven centuries after St. Benedict, and distinguished from the elder families by its blue habit, it claims the Patriarch of Cassino for its legislator and father. Also Read – November 26, 2018: St. Peter of Alexandria.